Sometimes one monitor won’t cover the whole room, with one you won’t get a full view on your precious child. Or, maybe, you have two babies in separate rooms. Babies require extra care and you can’t be everywhere at once, it’s not physically possible. The solution is rather obvious, get baby monitors for two rooms! You’ll be able to watch them as they’re near some appliances or on a walker and, keep in mind, these baby monitors come with 2 cameras so distance appropriately so it fits your purpose. Summer Infant Dual View – Specifically designed to give you two different views of a room. You can add two extra cameras as well (if you wish, look on page for more details). With low-battery and out-of-range indicators you’ll always be aware if something isn’t working. Some features are: that it activates by sound with LED lights, can zoom, and has night vision! Ensure your baby is safe as you can view the monitor on a 3.5 inch LCD high resolution monitor. Motorola MBP38S-2 – Watch your youngling on a 4.3 screen which shows what the two cameras records as they tilt or zoom upon your preference. With split-screen viewing it can pair up to 4 different cameras! The cameras can be distanced up to 1000 feet before they become out-of-range. Benefit from the built-in infrared night vision, highly sensitive microphone, low battery alert, and more. VTech DM221-2 – This is the only one that will mainly differ from the others on the list of baby monitors for two rooms. The reason for that is because, that it has no monitor. It’s mainly based on sound and audio. Fortunately, it’s not as annoying as you may originally think. It’s been made to block out white noise, provide only clear sound, and can be used as a “walkie-talkie” so you may comfort your loved one when you’re not in the room. 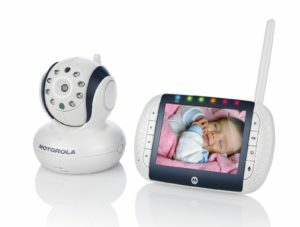 Motorola Digital – Back to the visual baby monitors. Including (but not limited to) power adapters for both cameras, infrared night vision and sound level indicators, and a 3.5 inch colored screen. Feel free to separate both cameras up to 590 feet with 2/GHz wireless technology. a temperature sensor I should say. Similar to the others, you can expand up to 4 cameras (the 2 others should be purchased separately). It also has infrared night vision, eliminates white noise, and enjoy safely watching your young one with a 4.3 LCD colored screen. Alicia-Online is a participant in the Amazon Services LLC Associates Program and is an affiliate with Petco/Petsmart.